WHITEHALL – Sometimes it’s better to get the hardest work out of the way first. The Oakridge girls basketball team may have done just that on Monday and Wednesday. 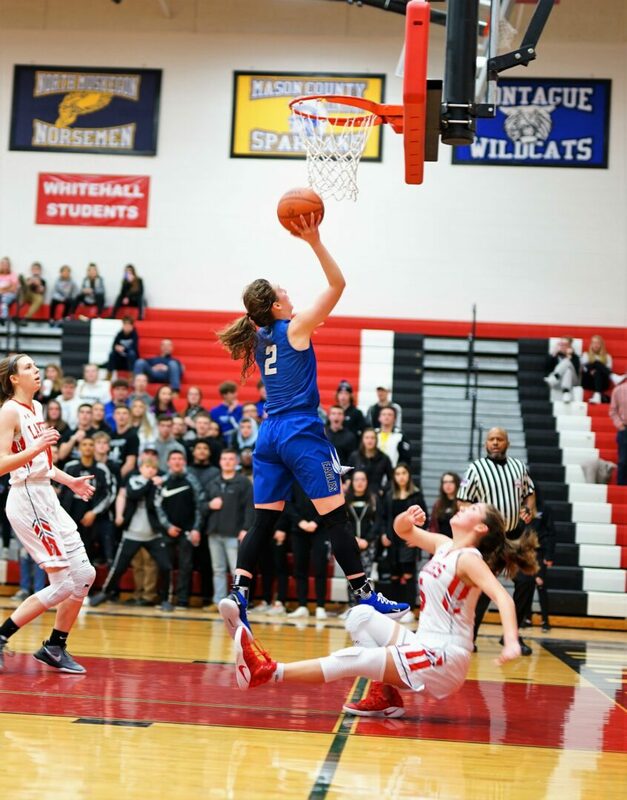 In Michigan, high school district basketball tournament matchups are determined by random draw, rather than seeding. So sometimes the best teams end up meeting in the early rounds, rather than the finals. 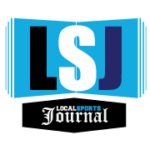 That happened to Oakridge, which battled past a powerful Whitehall squad in the first round of districts on Monday, then rallied in the second half to sneak past a very good Spring Lake squad 59-54 in the semifinals of the Division 2 tournament at Whitehall High School on Wednesday. The Eagles, now 19-3 on the season, advance to play underdog Fruitport in Friday night’s district championship game. Fruitport beat Orchard View 60-18 in the other semifinal on Wednesday. While the Eagles are not looking past the Trojans, they realize they managed to beat two very tough teams. 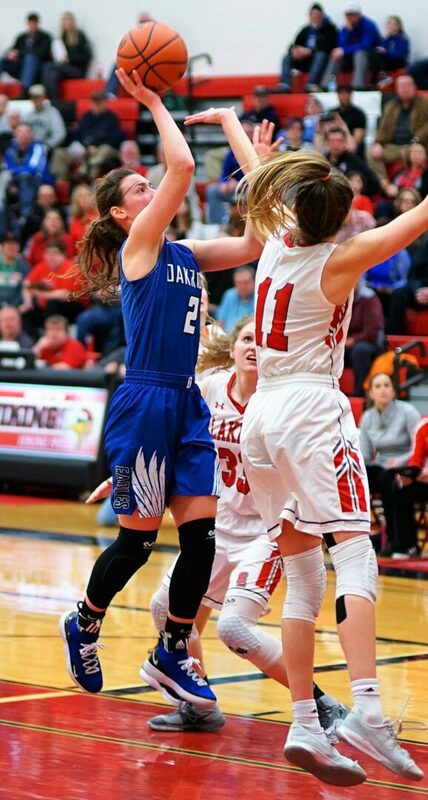 “Anyone can look at the draw and say it’s not ideal, but as I told the girls, we have to beat these teams at some point, there’s no difference if it’s the first game, second or last,” said Oakridge Coach Brad Tate, who took over a team this season that made it all the way to the state quarterfinals last year. Oakridge had to fight hard to get past a determined Spring Lake squad, which led 19-15 after one quarter and 30-28 at halftime. Three Eagles came up big in the second half to turn the game around. 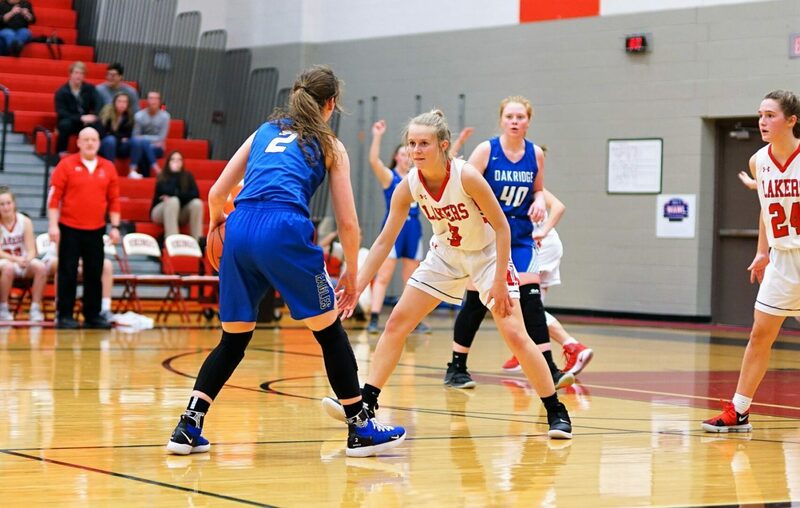 The first was presumptive All-Stater Sophia Wiard, who scored nine of her game-high 24 points in the third quarter, helping Oakridge grab a 44-40 lead headed into the fourth. 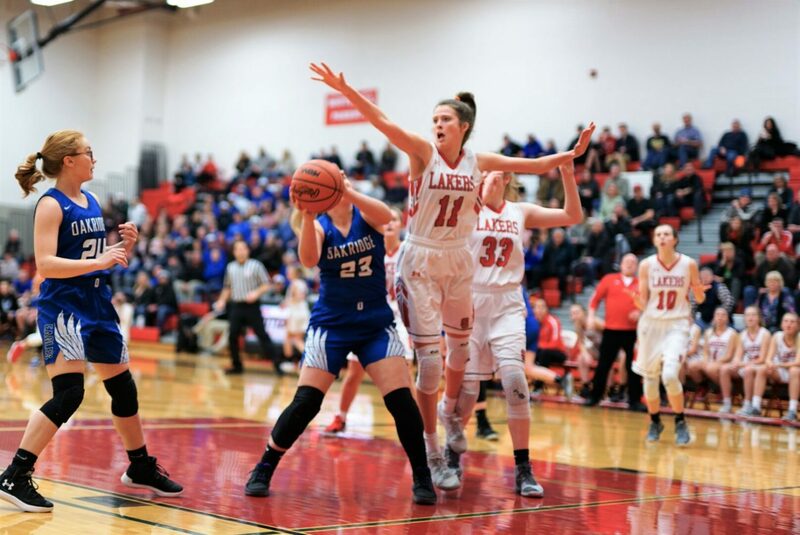 The second was junior guard Brianna Pastor, who hit a clutch layup with 4:10 left in the fourth, after Spring Lake had snuck back to take a one-point lead, then added a huge-three-pointer less than a minute later to put Oakridge up for good. It was the second big tournament game in a row for Pastor, a rising offensive force who finished with 16 points, including four triples. She scored 21 points on Monday against Whitehall, after averaging about nine points a game during the regular season. The third hero was sophomore Kyla Stewart, who calmly hit four free throws within the last 33 seconds of the game to nail down the victory. She finished with eight points. The Lakers were at their best in the first half, when they hit 10 of 21 shots from the floor, penetrated the lane very well, drew a lot of fouls, and converted 9 of 10 free-throw attempts. The made 15 of 18 from the line in the game. Abbi Perkins paced Spring Lake in the first half with nine points, including seven in the second quarter. But Oakridge erased the Lakers’ two-point halftime lead by opening the third quarter with a 12-4 run, and kept the advantage most of the second half. 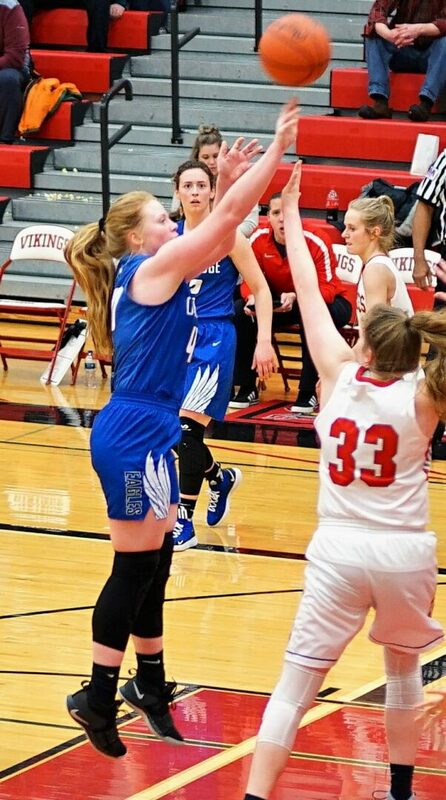 Spring Lake opened the fourth with a 4-0 run to tie the game 44-44, then took one final lead, 47-46, on a three-pointer by Jenna Core with 4:30 remaining. But Pastor answered with her five-point burst to give Oakridge the lead for good, and Stewart’s four three throws put the win on ice. 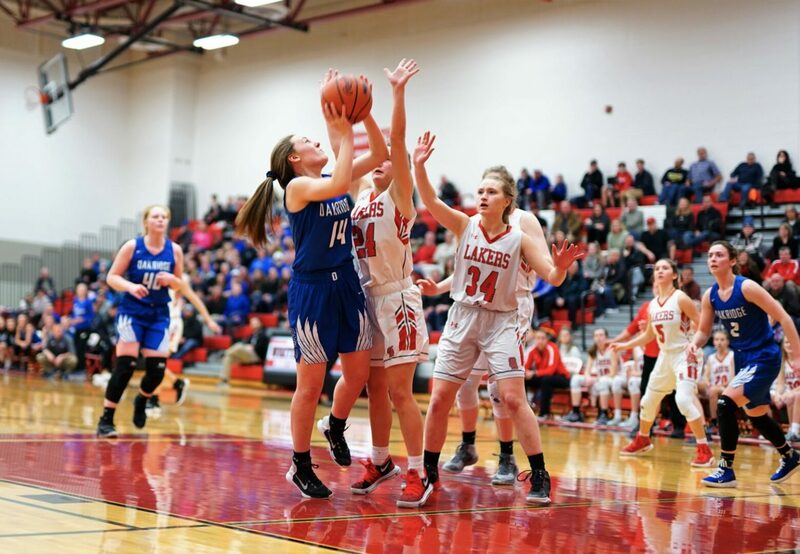 Perkins led a balanced Laker scoring attack with 14 points, Core finished with 12, Madeline Zenas added 11 and Phoebe Saunders scored 10, including eight points from the line.